These days, more and more people are opting for hardtop gazebos. They pose many advantages over their alternatives, which are soft top gazebos or wooden custom-built gazebos. Soft top gazebos are prone to elemental damage, usually induced by rain or snow. The moisture eats away at the fabric and dulls it, and fades the colour. Often, the sun eats away at soft top gazebos too, leaving a very tired looking patio at the end of it all. Soft top gazebos do not provide protection from rain, and they are not the most attractive feature for a permanent backyard installation. 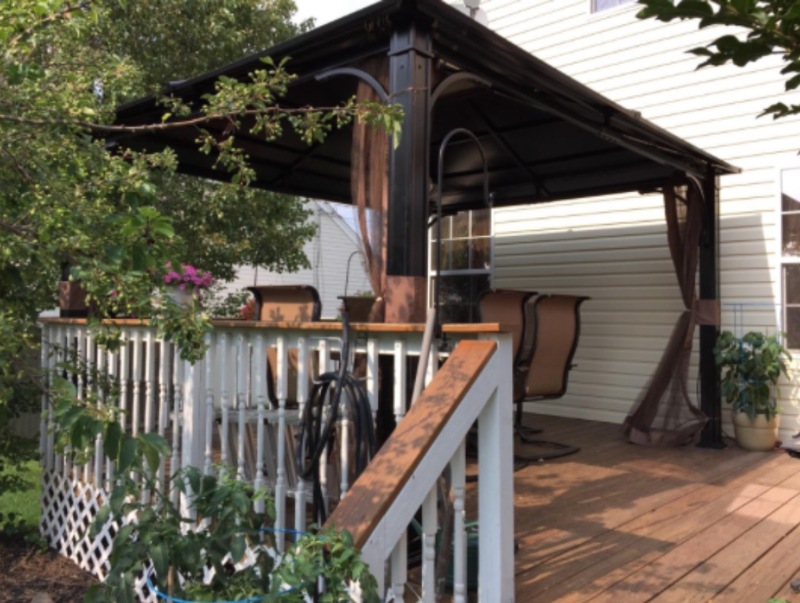 The purpose of a backyard gazebo is to provide shade, but also a focal point, or to have some kind of centering structure that draws people into it. You want something beautiful that will encourage not only guests but yourself to spend more time in the fresh air of your backyard, especially during spring and summer, and sometimes fall. Soft top gazebos are appropriate for camping and trips to the beach, but we do not recommend them for your backyard. A wooden gazebo is attractive but is prone to rot over time, and its shingled roof can require maintenance from time to time. They do become weathered over time. In addition, they tend to require a custom design and can be quite expensive once you have factored in the labour and material costs. We are in favour of hardtop gazebos, which have seen a growth in popularity in recent years. They are installed as a permanent fixture in the yard, providing shade and shelter, in addition to providing a grand focal point, perfect for setting up furniture and entertaining friends. We firmly believe, and science has confirmed that people are happier when they are surrounded by beauty. The psychological impact of a hardtop gazebo is something special, too. It creates a sensation of feeling protected, and closed in, while giving access to fresh open air. This allows you to fully enjoy every aspect of summer living without dealing with sunburn or being exposed to rain. Today we review the Sunjoy steel hardtop gazebo. It measures ten by twelve feet, and will need to be anchored down. It comes with L brackets on each corner for easy fastening. A great feature of this canopy is that it includes mosquito netting, zippered for ease of access. It will require some assembly upon receipt, but between two or three people it can be completed over the course of a weekend. Some tricks to installation include building the roof atop the walls, rather than building it on the ground. The roof will be very heavy if you build it on the ground and might require a handful of people to hoist it. Instead, finish all the roof supports, attach the frame that holds the cupola, and then carry the cupola and rest it atop the frame. After this, if you are brave, you can build the roof from your ladder, panel by panel. Most people who have bought and assembled this gazebo opt for installing the little roof first, and then doing the large roof panel by panel. This keeps the weight down, and requires only the work of one to two people. We recommend using galvanised steel screws to anchor it down. The gazebo will arrive in two very neat packages. Each piece will be carefully wrapped to prevent damage. From start to finish, this is a quality gazebo. We recommend going through the instructions and checking the hardware to make sure everything is in place before you begin installation, for the sake of avoiding a potential headache. Assembly is quite intuitive. Each piece is perfectly labelled to make it easier on you. They even have orientation marked, such as “this side up.” We only wish IKEA did this kind of labelling – it would have saved us much frustration in the past. The benefit of a hardtop is its longevity. It will just keep going and going. It will hold up to windstorms, it will not rust, or fade, and you can leave it up year-round. Keep in mind that it is wise to do a bit of regular maintenance on the gazebo, such as removing snow as it piles up. too much weight can crush anything, even the rooves of houses. The roof tint is rather dark, so it does attract the sun and melt the snow. However, removing the snow in the winter will only prolong the life of your gazebo and protect it from any potential damage. The gazebo, once installed, will bring a very grand air to your yard. It will encourage you to get outside and enjoy the fresh air. The mosquito netting is a very handy addition, and can be tied back at each post for a nice look. This gazebo sells for around $1300.